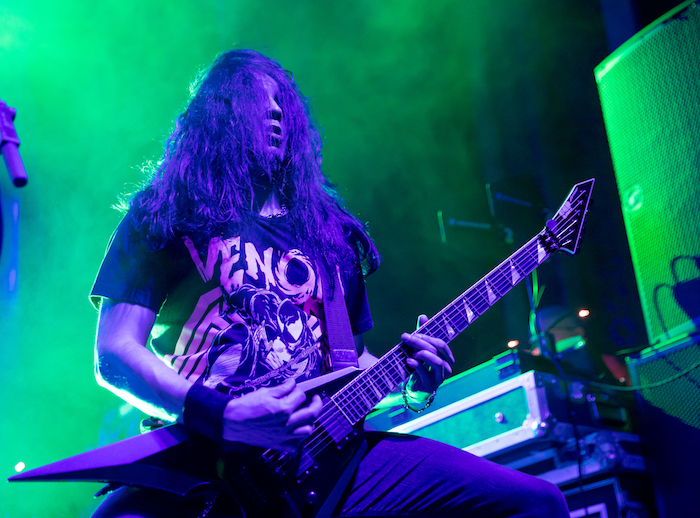 After twenty years of recording and touring around the world, Children of Bodom have become one of the mainstays in the underground metal community, even occasionally flirting with more mainstream success. While their songwriting became more polished and catchy after 2003’s Hate Crew Death Roll, many diehard fans secretly clamored for the group to play older material from the band’s first three albums: Something Wild, Hatebreeder, and Follow the Reaper. For many metal fans, these three records contain some of the most innovative and technically dense compositions of the band’s career, yet Children of Bodom would rarely play any of these songs on any of their recent tours, with many tracks from their early releases having never been performed in a live setting. To celebrate their 20-year anniversary, the band decided to craft a tour based around these older tracks, dubbed “The 20 Years Down & Dirty Tour.” The group rolled into the UC Theatre in Berkeley on a Sunday night to blow away the crowd with a high-powered set that comprised plenty of deep cuts and rarities from these albums mentioned above. Opening with the furious slash and burn attack of “Deadnight Warrior,” Children of Bodom sounded like a band with something to prove, with guitarist Alexi Laiho effortlessly working his way through the complex riffs and solos of the song. 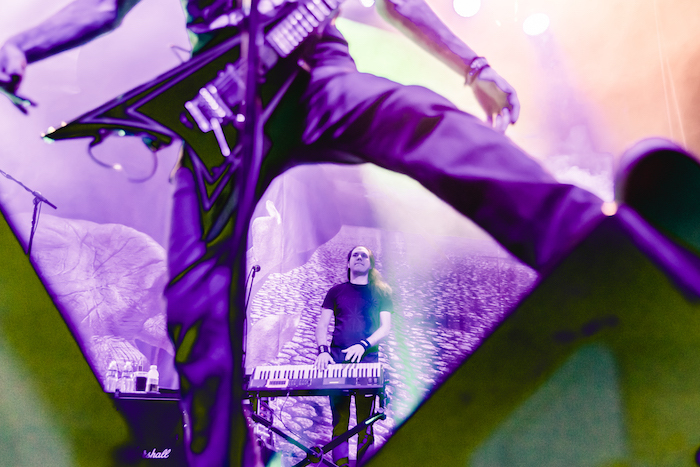 What makes old Children of Bodom so endearing to fans is the pronounced neo-classical compositional style that weaves in technically complex music at hyper speed tempos, incorporating plenty of harsh black metal influences. 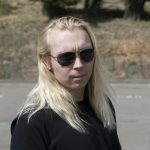 All of these songs are based around the virtuosic interplay between Laiho’s guitar and Janne Wirman’s incredible keyboard playing, with many songs featuring the two musicians harmonizing and trading off impossible-sounding solos. 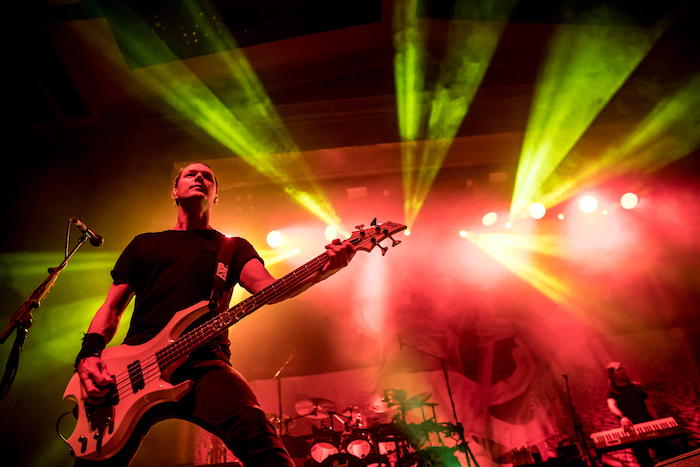 This was apparent on the following song, the blistering “In the Shadows.” Anchored by drummer Jaska Raatikainen’s propulsive rhythms, the track blends plenty of dark, classically inspired passages with plenty of rumbling heavy metal and dual guitar harmonies. Up next was one of the few concessions to later day Children of Bodom albums, the anthemic “Needled 24/7” from the Hate Crew Death Roll album. A furious piece of thrash metal, the song mixed the aggressive, harsh vocals of Laiho with a crushing groove from bassist Henkka Seppälä, along with plenty of rhythmically complex guitar. From here on out (except the mandatory inclusion of “Hate Crew Deathroll”) the remaining songs were all culled from the band’s first three records. From the all-out rampage of “Warhart” to the seldom played “Red Light in My Eyes, Part 2” Children of Bodom were knocking it out of the park with Laiho and second guitarist Daniel Freyberg having no trouble working through the complex web of guitar harmonies and fast licks present in each song. It’s hard to pick any standout tracks when every single one was performed with so much technical precision but “Hate Me!,” a deep cut from Follow the Reaper, would have to be up there. Beginning with a bit of spooky sounding keyboard trickling from Janne Wirman, the song rides an infectious mid-tempo groove along with plenty of harmonically complex guitar work from Laiho and Freyberg. As if the night could not get any better for the crowd (who had been going wild since the opening song), Children of Bodom returned for a two-song encore, playing the epic “The Nail,” a song that had never been performed live until this tour. 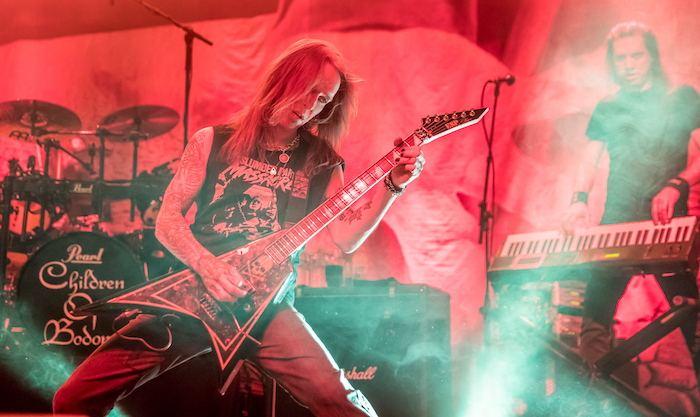 The song features a dizzying amount of musical complexity, with Wirman providing the perfect musical counterpoint to Laiho’s guitar work. Midway through the piece, Wirman and Lahio engaged in one of the most brilliant harmonies of the night, with the two musicians working through a series of changes that combined all sorts of technical wizardry and blinding speed runs. Laiho thanks the audience for their energy and support before the band launched into the closing song, the crushing “Towards Dead End” from the Hatebreeder album. As had been the case all night, the track was driven by another impressive set of guitar heroics from Laiho and Freyberg along with plenty of pummeling rhythms from Raatikainen and Seppälä. For fans, the night was a dream come true, as Children of Bodom not only managed to craft the ideal setlist but performed these songs flawlessly and effortlessly. It is a true testament to their lasting skills as musicians to be able to play these songs in concert. As has been the case their entire career, Children of Bodom are simply one of the most exciting metal bands out there, capable of leveling an entire audience, as was indeed the case on this night. Find out more about Children of Bodom here.